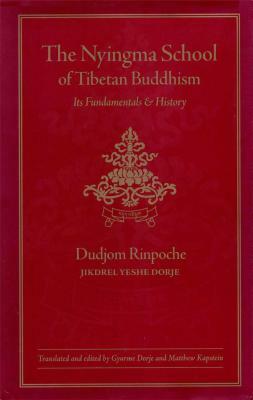 Written by a great modern Nyingma master, Dudjom Rinpoche's The Nyingma School of Tibetan Buddhism covers in detail and depth both the fundamental teachings and the history of Tibetan Buddhism's oldest school. This, the first English translation of His Holiness' masterwork, constitutes the most complete work of its type in the West. Dudjom Rinpoche (1904-87) was appointed by His Holiness the Dalai Lama as the supreme head of the Nyingma tradition of Tibetan Buddhism. He was an enlightened yogi and meditation master, a discoverer of concealed treasure teachings (a terton) who was inseparable from Guru Rinpoche [Padmasambhava], the most prolific of contemporary Tibetan scholars, and an incarnate lama who had intentionally emanated for the sake of sentient beings for seventeen successive lives. Gyurme Dorje holds a PhD in Tibetan Literature and an MA in Sanskrit with Oriental Studies. From 1991 to 1996 he held research fellowships at London University, where he worked on the Encyclopaedic Tibetan-English Dictionary. He has written, edited, translated and contributed to numerous books on Tibetan culture. Matthew Kapstein is Numata Professor of Buddhist Studies at the University of Chicago. His previous publications include the Tibetan Assimilation of Buddhism: Conversion, Contestation, and Memory and, with the anthropologist Melvyn C. Goldstein, Buddhism in Contemporary Tibet: Religious Revival and Cultural Identity. He is co-translator of the late H.H. Dujom Rinpoche's The Nyingma School of Tibetan Buddhism. Since 2002 he has also served as director of Tibetan Studies at the ecole Pratique des Hautes etudes, Paris.